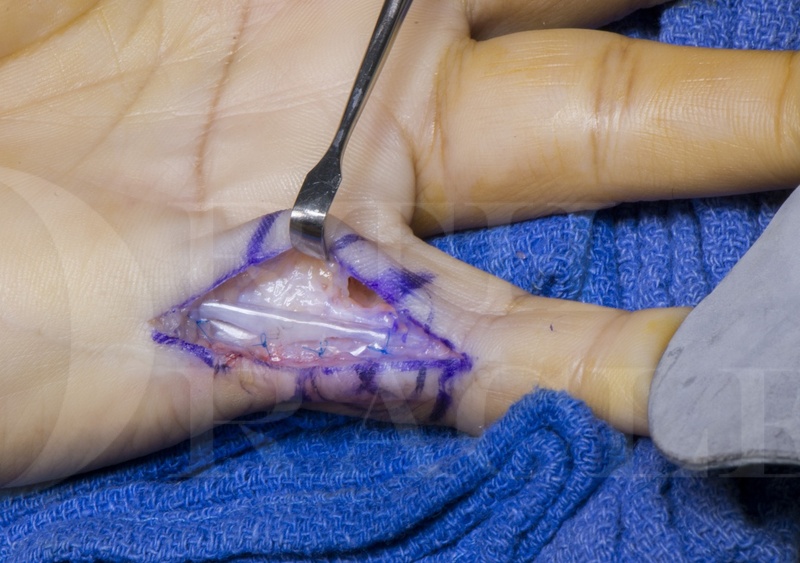 Learn the Neurolysis digital nerve plus Vivosorb barrier wrap (Polyganics) and Z-plasties to scar contracture left little finger surgical technique with step by step instructions on OrthOracle. Our e-learning platform contains high resolution images and a certified CME of the Neurolysis digital nerve plus Vivosorb barrier wrap (Polyganics) and Z-plasties to scar contracture left little finger surgical procedure. Complications of digital nerve repair include neuroma-in-continuity formation and tether in scar. A neuroma is clinically defined by a non-progressive Tinel’s sign at the site of injury and repair with no functional sensory recovery distal to the repair. Nerve tether is typified by a painful scar and exacerbation of symptoms of pain and paraesthesiae on passive stretch. When there is no distal sensory function consideration should be given to revision surgery for excision of neuroma and graft reconstruction of the resultant gap. In such cases the use of a processed nerve allograft is superior to autograft when the patient has significant neuropathic pain and sensitisation. If there is some distal protective sensation and the Tinel’s sign is moderate t the site of repair, the surgeon should consider a neurolysis at the site of repair and the option of wrapping the repair site with a barrier to further scar formation. The Vivosorb is a polycaprolactone bioresorbable membrane that can be wrapped around the nerve following neurolysis and protects the nerve from scar formation in the weeks following revision surgery.